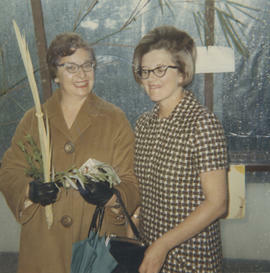 Photograph depicts Mrs. Phyllis Solomon (wife of Wilfred Solomon) and Mrs. Hayes. Photograph depicts a group of unidentified men standing before a commemorative plaque. Photograph depicts (l-r) Mrs. Ed. Donner, Mrs. M.B. Cohen, Mrs. W. Solomon, and Mrs. M. Fox at a dinner table. Photograph depicts two unidentified men in the synagogue. A group of children with two unidentified women. Interview with Arthur Guttman. Interviewed by Debby Freiman. 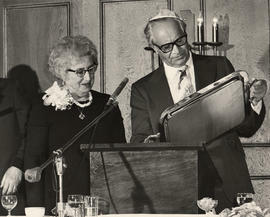 Interview discusses early history of Temple Sholom and Arthur and wife Glenda's involvement its formation. Photograph depicts (l-r) Arthur Weinstein, BT programming chairman, Father Michael A. Daniel , and Rabbi Cohen.